Tomorrow is Halloween Night. This is one of the few holidays we don't spend much time on every year. It used to be a much bigger deal when the kids were younger, but now that they don't trick or treat, we really don't do much at all. We were never into the decorating thing, other than a few pumpkins that we'd carve up. I think this year we may even turn out the lights and pretend we're not home. I'm much more okay with Halloween than Donna, who has never been a big fan. I had my bag stolen at the end of a long night of trick or treating when I was a middle schooler, so I can certainly see how it might not be someone's favorite night. I'm just vanilla about it, I guess. As I say, it was a little more fun when the kids were able to dress up. There was a day when we used to dress up and go to Halloween parties, but that was way back when I had hair. We haven't dressed up or gone to a party for at least 18 years, I'm guessing. When we did, I went as a pirate with a pigeon on my shoulder as a parrot. People kept pointing out that it was a pigeon, but hey, Goodwill was out of parrots, evidently. I can't even remember what Donna went as at that party it was so long ago. There were other parties, back when I was single and costumes parties were all the thing. I went to the State Street madhouse in Madison on a couple of occasions. At one I went as a man covered with maps. I also had "You are Here" and a line drawn down to my nose. Because of my pointy hat, I had one person mistake me for the Tin Man from Oz, and another for a Ku Klux Klansman. Evidently the fact that I was covered in road maps was lost on these students of higher education. As the evening got rowdier, I had people trying to find their streets on me as we walked along the crowded street. Like any costume, it was a real treat to drive in as well. A costume I wore a couple of times was some Lycra snakeskin pants with a sleeveless Lycra top. They were skin tight and as frightening as they sound. My friend bought them as a joke and they were used for occasions just like this. I was going as a rocker ala George Thorogood, who wore them with much more dignity. I can't believe I wore them (twice to two different Halloween gigs, years apart), but I actually fit right in in Madison. One year when I was working at Intelligraphics I went to a house party dressed as the HHH Metrodome. I'll admit this idea was stolen from my brother Paul who actually went out as the same thing the year prior when he came down from the Twin Cities to visit. How do you dress as a building, you ask? Think umbrella painted silver and a piece of green indoor outdoor carpeting with a hole cut in it and a football field lined on it. It was ingenious, but again, I had to explain it to people. 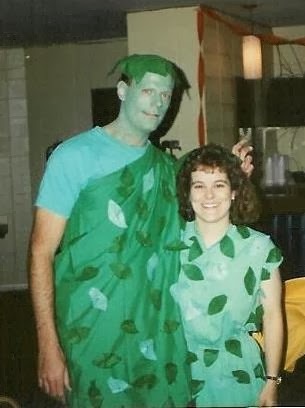 My wife and I went as a couple to an Intelligraphics halloween party as the Jolly Green Giant and Little Green Sprout. This was a hit, mostly because of our height difference. Credit goes to Donna for doing all the costume design and leaf attachment. So, we weren't always Halloween scrooges. Nowadays, if we had to we might give it a go again. It's just not that big of a thing anymore. I don't hold anything against anyone who does, whatever lights your candle, but it's not something I want to spend a lot of time on. In any case, Happy Halloween everyone!